You all know that I love homemade gifts. It’s not like I don’t like store bought items, but homemade gifts made with personal care and time and are customized for the recipient. 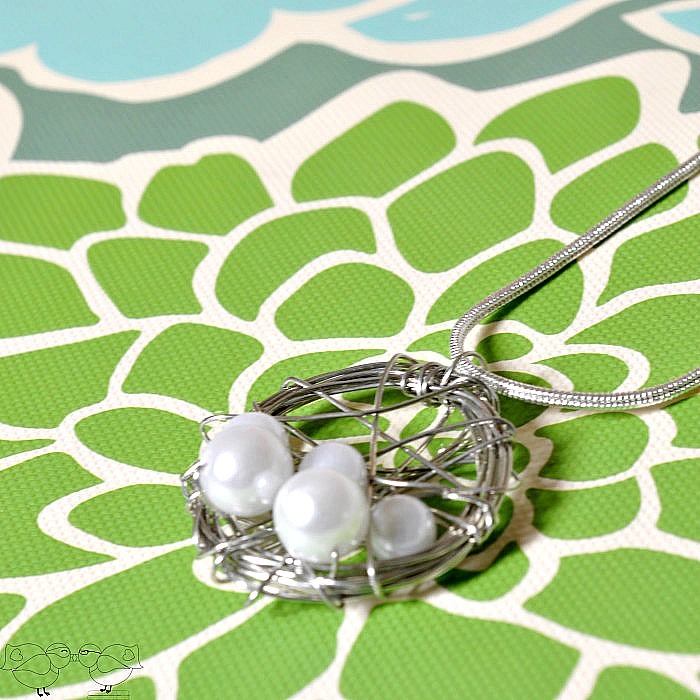 Enter this Mother’s Day gift idea for all of you: a Birds’ Nest Necklace. 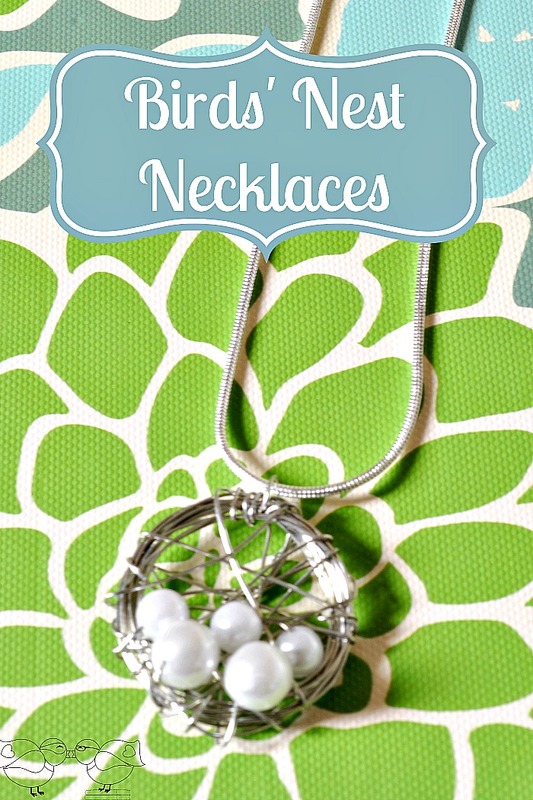 This necklace with 5 pearls would be perfect for my mom as a grandmother gift because she currently had 5 grandkids. Customizing it for her in mind makes it more special because the beads represent her family. Homemade gifts can also be budget friendly. I spent about $10 (before coupons) for all the materials for this necklace. $10 sounds great for a pretty, personalized gift right?! But with $10 you can make multiple necklaces for mom, grandmas, aunts, etc. You would never know that you only spent a few dollars on such a sweet necklace, and I promise I will never tell your family and friends! 1. Start wrapping the wire around two fingers at least 10 times. 2. Pull the wire off of your fingers and shape the wire into a circle. You will also want to pull apart the form a little bit to make it a little messy. You can even add a few more circles around. Remember – nests are messy so you don’t want this to be neat and tidy. 3. When it seems full enough, wrap the wire around the outside and loop it through. This will keep it secure. At this point, you will want to cut the wire. Give yourself at least 6 inches or extra length. 4. Start adding your beads one at a time where you would like them to be. After adding each bead, wrap the wire around the outside of the frame or down into the nest and around. Taking the time to wrap the wire around will make sure they all stay in the right spot. 5. When all your beads are in place, wrap the wire around the outside a few times to secure the wire. You will want to do this at the “top” of the nest/necklace as you imagined it. Make one of the loops in the middle a little bit longer so your chain can go through the loop. 6. Tuck in the end of the wire and you are done!! The whole process takes about 5-10 minutes. It definitely goes faster the more necklaces you make. Another benefit of this craft?! This is definitely kid friendly. I don’t think my 7 year old niece could make this on her own, but she could definitely help during certain stages, like wrapping the wire around the middle or threading the beads onto the wire. I do think her older sister in 6th grade is coordinated enough to make this necklace though thought she would probably need help with the finishing touches. I really love how this necklace turned out! It makes such a sweet Mother’s Day gift but it would also be great as favors for a shower, especially a little bird baby shower. So many possibilities for this project! This is such a great necklace. I really like the fact that you gave instructions so we can make it at home as well. Wow, that is so pretty! I’ve always wanted to try making jewelry, this is cool! Thanks for the tutorial! I can’t believe you made this! What a cute idea! Ok, you make it look too easy. It can’t be that easy, can it? I have one of these but I bought it! I love this tutorial so I could make it for friends. Gorgeous! I would love one ! This came out so pretty! I love the little pearls as the eggs. You did such a great job with this! I love this necklace. I wear pearls almost daily and this is so unique. A very cool necklace! You’re very crafty! I know so many ladies would love to wear this! What a cute idea! Great tutorial too! My mother-in-law would love this! Love the way you have these places. I make mine centered in the nest and it’s hard when you get more than 4 eggs in there! My sister made me one of these and I adore it! Such a great gift for Mother’s Day! I absolutely LOVE it. That is a gorgeous necklace! This would make such a great mothers day gift, so thoughtful and personal. I love it! This turned out beautifully! I would definitely wear it! I think maybe I can even make one. Thanks!